Gorgeous views of the Caribbean Sea, luxury amenities, gourmet cuisine and an adults oriented atmosphere… All at the Maxim Spring Party 2016! This weekend, Sandos Cancun Luxury Resort will be your host for the year’s best pool party in the stunning beach destination of Cancun. The second annual party by Maxim Mexico magazine will take place April 15 – 17 on a stunning white sand beach with three infinity pools that descend toward the turquoise water of the Caribbean. As the host of the Maxim Spring Party 2016, we’re thrilled to have this opportunity to show off our beautiful hotel, gourmet cuisine and incredible location in the Cancun Hotel Zone to all of the guests. There will be events open to the public, for hotel guests and also exclusively for VIPs during this three-day party. And of course, a good party wouldn’t be complete without some good music. Guests will enjoy music by Alan Solomon and a very special surprise guest. The Maxim Party in the US has been considered one of the biggest events of the year for over a decade, and now Maxim Mexico is hosting one of the best parties in the country with a huge list of celebs and VIP guests in truly stunning locations. And of course, if what you’re looking for is a complete vacation with all the luxuries offered by our Total Gourmet Experience all inclusive plan, visit Sandos Cancun at Sandos.com to book a beach vacation you’ll never forget. Our hotel boasts gourmet restaurants, unlimited drinks, a white sand beach and beautiful views of the Caribbean Sea or Nichupte Lagoon from every room. 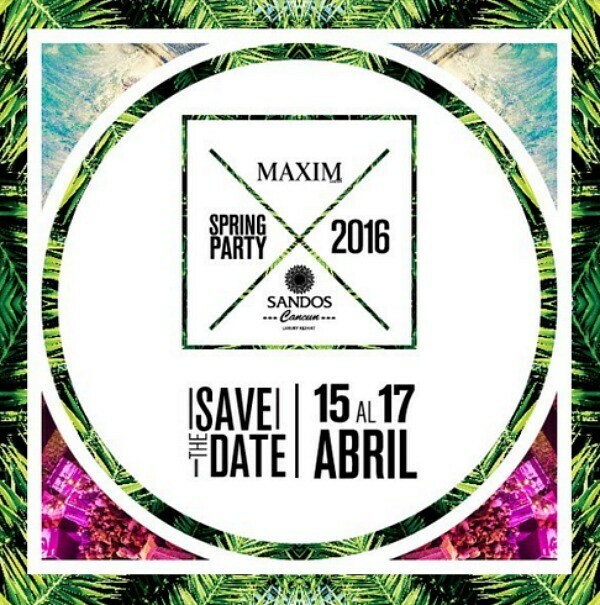 We hope to see you this weekend at the Maxim Spring Party 2016! What Makes Us a Four Diamond Resort? Totally elitist! As a week-long guest of the resort, Saturday the 16th was my last day and I planned to spend it lying poolside at the middle infinity pool. Instead the 1st and 2nd infinity pools were fenced off to paying guests and the only pool available to us was the very warm “kiddie” pool. How disappointing to stare longingly at the cool waters of the upper infinity pools unable to access! Then to see the Maxim guests rapidly deteriorating as they consumed alcohol and primped and preened for photographers. Some fun!